As with her sisters, Kathleen and Poly Ngal, Angelina Ngal began producing batiks in the mid 1980’s and wooden sculptures, probably influenced by her late husband, the older brother of Cowboy Loy Pwerl. She was formerly known as Angelina ‘Pwerl’, her husband’s name. Pwerl(e) in Alyawarr language is the equivalent to Ngal in the Anmatyerr language, and it is as Angelina Ngal that she is referred to today. She began painting as part of the CAAMA ‘summer project’ in 1988-9 and, already at 40 years of age, was included in the first exhibiton of Utopia women’s paintings held in Alice Springs in 1980. Angelina quickly adapted to painting on canvas and subsequently gained an international recognition. Her work can be seen as a contemporary dialogue or translation of the cultural, geographic, social and religious components of Anmatjerre life. Her intimate renditions of country are delicately layered and can be read and appreciated at a superficial level for their abstraction and painterliness. At a deeper level however, they depict the cultural and social mores of the society in which she lives. Angelina paints her grandfather’s country, Arlparra. Many of her paintings depict the Bush Plum, which she represents through a focus of red dots into which she merges a variety of minutely and painstakingly rendered coloured dots ensuring that the tiny red dot is always centered, and clear. 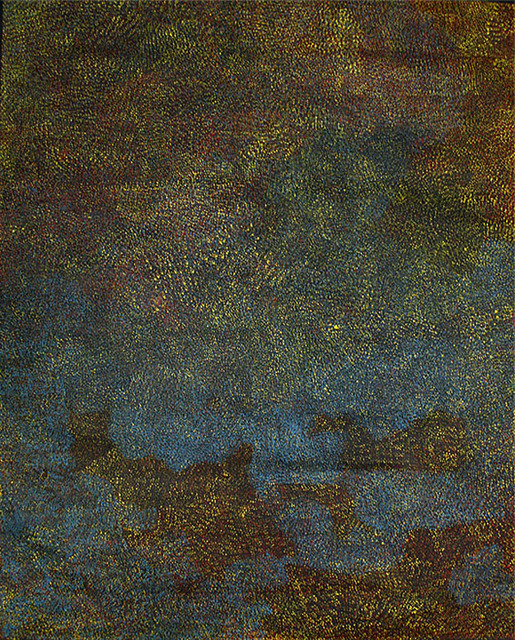 She has further extended her painting producing a range of exquisitely coloured compositions that maintain a layer of meaning related to the Bush Plum, in which points of geography, knowledge of places and memories of hunting or ceremonial business, result in a subtle and textured surface that hints to the viewer of an ethereal numinous landscape. Following exhibitions with Niagara Gallery, her inclusion in the Sydney and Melbourne Art Fairs, and more recently during the last two years with Lauraine Diggins in Melbourne, interest in, and admiration for Angelina’s paintings has grown rapidly. She was a finalist in the 2008 Wynne Prize for Landscape painting at the Art Gallery of New South Wales and this was followed by her inclusion in the exhibition Emily Kngwarreye and her Legacy at the Art Front Gallery in Tokyo, Japan 2008, and an exhibition of Utopia art at Rebecca Hossack Gallery in London in 2009. Her works first appeared at auction under the name Angelina Pwerle in 2000 when an excellent rendition of her bush plum works sold for $6,325 at Christies in Melbourne. Measuring 177 x 176 cm this painting would be worth close to $30,000 today. By 2004 her auction record set again established by Christies for a work of similar size had risen to $14,000. In just years the unit price of her work had risen from $20/sq.dm to $46/sq.dm, a strong indication of her increasing reputation and the strong demand for her best works. Her current auction record was set by Lawson~Menzies for the magnificent 150 x 374 cm canvas Spring Flowers at Arlpara 2007, which was a featured lot in Lawson~Menzies November sale during the same year in which it had been created. Its sale price of $38,400 reflected the fact that it had been strategically placed in the secondary market in order to underpin and firmly establish a benchmark for this increasingly important artist. Angelina Ngal’s exquisite abstract aesthetic has now established her as one of the pre-eminent artists from the Utopia community. The work illustrated is a fine example of her strongest work. It embodies a wonderful synthesis of contemporary abstraction and Indigenous ethereality by imparting a feeling for both the physical, and the spiritual nature of her Warlpiri homeland.